Today, I only had to work at my day job til noon. I felt pretty good, and look what I accomplished! Yahoo! The whole center of Starry Log Cabin is put together! I have the border fabric washed and dried. It looks like this is really going to get finished. What a good feeling! Tonight, I will spend some more time on stitching binding on Carrie & John’s cattle brand quilt while I watch TV. I have to remember to watch Jay Leno tonight because Johnny Depp will be on the show. Hope your Friday was fantastic, too! Oh, that is pretty Randi. Randi – I love it! Can’t wait to see it with borders. Great job! Good for you, Randi! It’s looking fabulous! Congratulations on getting so much done – I look forward to seeing the borders on it, too. Randi, this pattern has been one that I’ve wanted to make for a long time……you’ve just rekindled my desire after seeing yours. 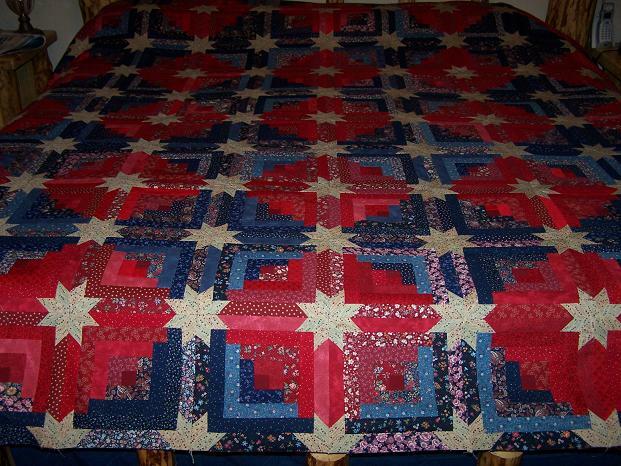 Your quilt is beautiful… love the colors and those stars look so flat! No B cups anywhere. : ) Please post a photograph when the quilting’s done.